You are and your business are on the move. That means you need to be able to work from anywhere, across your devices, and have a consistent and fast experience. 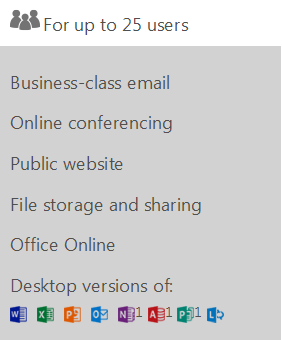 That freedom is what you get with Office 365. Whether you’re at your desktop or on your tablet or phone, you can get to your documents, email and calendars, shared files, and online meetings. And wherever you access it, it’s always your Office, so your files are up to date and your recent documents just a click away. You need to build your brand so your business stands out. Think of Office 365 as your marketing support. You can brand your email with your own domain name, so every message you send builds name recognition. Promote your business with a professional website that’s easy to build and update—with no additional hosting fees. Grab people’s attention with customized marketing materials you design to fit your brand and customers. Holding online meetings with HD video and screen sharing is sure to impress, too.